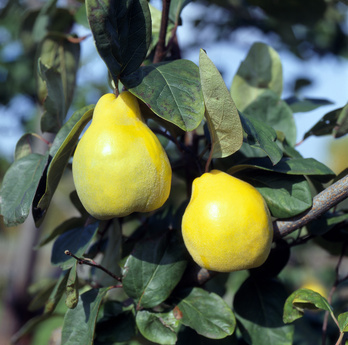 Quinces are a native of southwest Asia and have been cultivated in Europe since classical Greek times. They are better known as a rootstock for grafting pears because of their dwarfing and early fruiting characteristics. Trees can grow to a height of four or five metres, producing white or pale pink flowers in spring and golden yellow, downy, pear-shaped fruit in autumn. The fragrant fruit are not normally eaten raw but are rich in pectin and are used to make jellies, jams and desserts. The flesh turns red after cooking. Quinces are a worthwhile addition to any orchard or as an interesting specimen tree in a large garden. Like all fruit trees, they prefer an open, sunny site, sheltered from strong winds. They are generally self-fertile. Once they are established, quince need little care except for the removal of dead or poor growth and occasional branch thinning to produce a vase shape, as for apples. They can be propagated by chip-budding in summer or hardwood cuttings in autumn. Popular varieties are ‘Smyrna’, ‘Champion’ and ‘Van Dieman’.